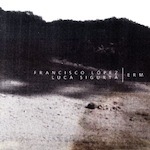 Francisco López has been around the block somewhat with a massive career in sonic art formulation. This two-track album is shared with Luca Siguratà as a collaborative effort with each artist using the same sound sources. López’s works for me have been somewhat hit and miss. Occasionally there are some albums that have really stood out, but when dealing with media the way he does, a lot of the time the end results appear to be as much aural art rather than music itself; once again unfortunately, the latter appears to be the case. Glitch pulsations chop and slide, before ambient tones and then harsher sounds cut in. There are undercurrents of noise that do at least provide a foundation to the track, but for the most part it just seems like a misshapen collection of noises thrown together. Siguratà works better with the medium at hand, providing a bleaker and more cohesive interpretation. Rumbling ambience is occasionally smattered with noise; but where his collaborator failed, he manages to pull into something altogether more constructive. It may not be the best I have heard genre wise, but at least it’s a solid track with some form and purpose. Overall I see little point to the release as a whole and Siguratà would have most likely benefitted from releasing anew album all on his own. I can understand his logic in wanting to work with his peers, but sometimes it’s those influential artists who produce less than is expected.